Drop off your kids at Parents Night Out Kids Craft-O-Rama* with The Crafty Kids! Let The Crafty Kids take care of your little ones while you enjoy a night off that you deserve! Hosted at our fabulous art studio filled with child-friendly art materials, abundant toys, and mesmerizing activities, this event provides a home where your children can explore and expand their natural talent. Your child will learn art techniques by getting messy with fun craft projects and we supply all the materials and clean up the mess! Our craft projects are original designs by The Crafty Kids guaranteed to delight all boys and girls ages 3-9 years old. Various activities give plentiful space for your children to grow socially, physically, and creatively while making every moment fun and meaningful! Make sure they come hungry, because our pizza dinner and healthy snacks help myour kids have an enjoyable night while you do too! Get your mini-artists ready to experience crafting like never before by making long lasting mementos of their fun time before they take their creations home! In each 3-hour Parents Night Out children will enjoy two crafts, a movement activity, snack time, meal time, a group activity, an individual activity, and open play! All projects led by our professional and friendly staff on site! Drop off your children or we can pick them up from school! Need a break at another time? We can arrange it with Parents Night Out on Demand! Just let us know one week in advance and we can schedule a special session for your child. Four children minimum required. 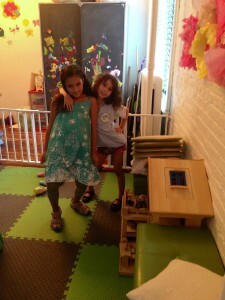 Children (3-9) can join in the Friday Night Fun at The Crafty Kids at our Lower Manhattan Art Studio! Children at The Crafty Kids! Parents out on the town! Each session includes a snack and the following in a single fun theme! Visit our Parents Night Out page for more information. $40 per session. Add on hour is $20. Sibling is 50% off. Advanced registration required. *A registration form must be completed in order for any child to be enrolled in a drop off session. Please complete the form located here. All children must be potty trained for drop off classes. *Afterschool pick up available from PS 397 and PS 343. Children must be potty trained.